The question regarding attribution of recent heat waves being 'climate change' or 'global warming' remains a confusing issue for many. The reality is that the data indicates it's both. In other words, it's summer and it's global warming. The best way to examine this is to recognize two things. Summer happens and summer is warmer than winter; and we have increased the total radiative forcing of the atmosphere by increasing the greenhouse gas content. Therefore, it's both. All natural variation is now occurring on a different radiative forcing path. The trends clearly indicate that hot records are outweighing cold records which matches the expectations for a warming world. The trends indicate are in line with the general forcing and change in temperature. This is only one out of many lines of evidence. It remains that there are no evidence lines on a global scale that indicate the planetary temperature is either stable or cooling, or that it is natural cycle. The conclusion remains that the current warming is strongly human influence. The US is indicated to have experienced anonymously high temperatures having the hottest January through July period in the instrumental record. Statistical analysis clearly implicates the increased radiative forcing as a significant cause factor over and above the odds of natural occurrence for the recent large heat waves that Earth is experiencing. New analysis of the data reveals unambiguous connections to human induced forcing. Additional research is examining other types of climate extremes in precipitation and event intensity. 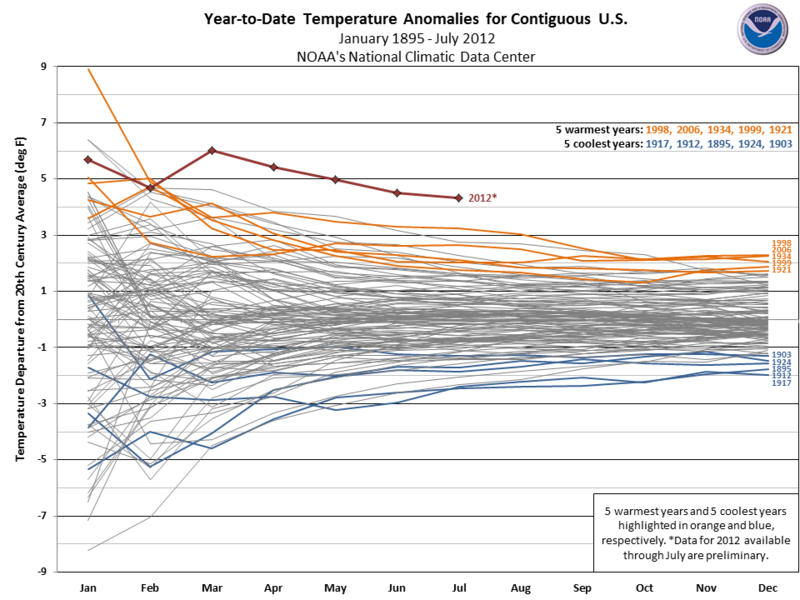 Year-to-date temperature, by month, for 2012 (red), compared to the other 117 years on record for the contiguous U.S., with the five ultimately warmest years (orange) and five ultimately coolest years (blue) noted. The 2012 data are still preliminary. Please click for a more thorough explanation. The focus for them is on adaptation to a warmer world. Many farmers are coping with climate change now. Whether or not everyone 'believes' in climate change is now immaterial with regard to increasing impacts on trend. with increasing stress on crops due to changes in the hydrological cycle and heat stress, more and more farmers are seeking answers from modified crops to heartier breeds of cattle that are more accustomed to drought conditions such as those that come from Africa and India. Realistically speaking, now one can say that it's not just the climate that is changing, our crops and our cattle are changing too. One wonders if there is an irony in the notion that we are immigrating new breeds of African and Indian cattle because America cattle cant' seem to handle the heat. 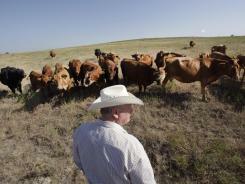 Cattle rancher Ron Gill looks over his herd in Wise County near Boyd, Texas, Aug. 1, 2012. Gill has been cross breeding cattle with more drought tolerant breeds.